Media Appearances - DiBella Law Offices, P.C. DiBella Law Offices, P.C. is a full-service law firm, qualified to handle personal injury claims, drunk driving (OUI) defense, divorces, and much more. Attorney Christopher DiBella has been the recipient of numerous accolades and awards, and has even been featured in Boston Magazine on account of his selection to the list of Super Lawyers® Rising Stars℠. If you are in need of an attorney, call (781) 262-3338 for a free consultation. The firm has offices throughout Middlesex and Essex Counties. 98.5 The Sports Hub is one of the largest sports radio stations in all of New England. If you are a regular listener to 98.5, you’re obviously aware that it is playoff time and the Bruins and Celtics are in the thick of it. And as a Sports Hub listener, you’ve definitely heard ads for local attorney Christopher DiBella stuffed between the scores and the latest update to the saga of Tom Brady’s jersey. Tune into 98.5 to hear our ads today! 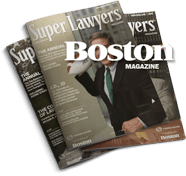 Named in the Super Lawyers® Rising Stars℠ List by Boston Magazine. From 2011 through 2017, Christopher DiBella was featured in Boston Magazine for his selection to the list of Rising Stars℠ in New England. Lawyers are asked to nominate the best attorneys who are 40 or under. No more than 2.5 percent of the lawyers in the state are named to the list.